Coordinate Jewellery makes for the ideal gift for the intrepid globe trotter. Latitude & Longitude Necklace hand engraved with the coordinates of a special place to you. Inspired by the time of ancient Greeks when explorers travelled by starlight – the lost art of celestial navigation – where the sun and eclipses of Jupiter’s moons revealed the secrets of their exact location. Knowing that the coordinates of your chosen location is determined by the starry night sky makes the Latitude & Longitude Necklace a gift with that all important extra touch. 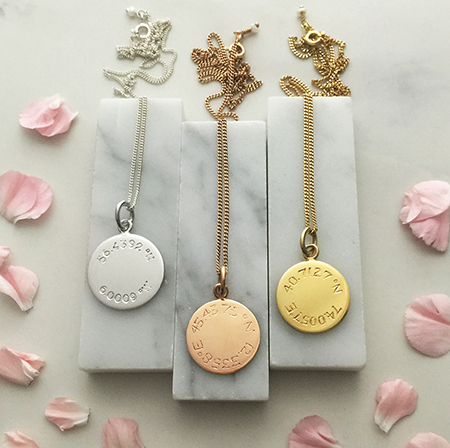 Latitude & Longitude Necklace, a unique personalised necklace that will certainly go down a treat, available in Sterling Silver, Rose Gold Vermeil and Yellow Gold Vermeil.